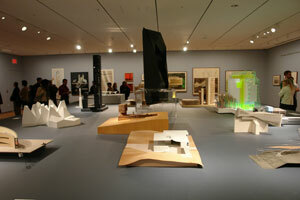 Tel Aviv Museum selected as one of ten buildings for In Pursuit of Architecture, MoMA, September 21, 2013. Taiyuan Museum featured in "Top Architectural Trends" in Departures Magazine. Georia Tech's Drawing Summit "Infamous Lines" will feature a talks by Preston Scott Cohen, Dora Epstein Jones, Volkan Alkanoglu, and George B. Johnston. 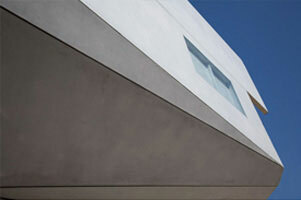 PSC's Tel Aviv Museum of Art is a finalist in the Museums category of the A+ Architizer Awards. The winner of the Architizer A+ Popular Choice Award is determined by voting open to the public Feb. 14 - March 8. Preston Scott Cohen will give a lecture for the Mint Museum Contemporary Architecture and Design Series at the Mint Museum Uptown in Charlotte, North Carolina at 7pm on Thursday, Feb. 7. "Tel Aviv Museum of Art"
Architectural Record publishes PSC's canopy for Goldman Sachs in their October edition. Architect Magazine publishes PSC's Arcade Canopy for Goldman Sachs in lower Manhattan. Visit our facebook page to keep up to date on all our news and projects. Harvard Design Magazine #35 Publishes Preston Scott Cohen's "The Hidden Core of Architecture"
Peter Cook reviews the Tel Aviv Museum of Art for The Architectural Review. Frame Publishers names Herta and Paul Amir Building, Tel Aviv Museum of Art as #1 of Top 10 Museums. Michael Kimmelman reviews Preston Scott Cohen's Arcade Canopy in New York for the New York Times. "A Canopy as Social Cathedral"
"Complexity" Exhibition curated by Levon Ayrapetov and Valeriya Preobrazhenskaya features work by Preston Scott Cohen, Peter Eisenman, Eric Owen Moss, Morphosis, Coop Himmenb(l)au, Tom Wiscombe, Atrium Anton Nadtochi, TOTEMENT/PAPER, and Studio EDAS. Preston Scott Cohen is featured in From Nothing, Something film screening at the 2012 Boston Independent Film Festival. Robert Cambell reviews Preston Scott Cohen's "Lightfall" exhibit in the Boston Globe. "Examining structures, and creating them, with digital tools"
The Herta & Paul Amir Building, Tel Aviv Museum of Art wins the award for Best Museum in Travel+Leisure Magazine's 2012 Design Awards. Exhibit about Preston Scott Cohen's Tel Aviv Museum of Art opens in the Gund Hall Gallery at the Harvard University Graduate School of Design. January 17, 2012 - March 4, 2012. Preston Scott Cohen's Herta and Paul Amir Building at the Tel Aviv Museum of Art opens to the public November 2nd. The Tel Aviv Museum of Art will mark the opening of its new Herta and Paul Amir Building with a day-long international symposium on architecture. Preston Scott Cohen, Sylvia Lavin, Jeff Kipnis, Dan Sherer, Jesse Reiser, Inaki Abalos and Ben Van Berkel will discuss numerous themes including the tension between the two prevailing models of museums today: the museum of neutral white boxes, allowing for maximum curatorial freedom, and the museum of architectural identity, conducive to the production of public spectacle. These defining issues of curatorial vs. architectural conceptions, and of art vs. public life, motivated the design of the new TAMA building, where the galleries are the life and soul of the entire museum, even while being organized around the powerful architectural spectacle of the spiraling "Lightfall." An antidote to the Bilbao phenomenon, the new building of the Tel Aviv Museum of Art represents a new direction: an interiorized and socialized space of spectacle, as opposed to the '90s model of an exterior sculptural object displayed to the city. Architect Magazine awards PSC with the 2011 Progressive Architecture Citation for the Ordos 20+10 Office Complex. Our newly expanded office - in a building renovated by Machado+Silvetti - opens at 179 Sidney Street. The New York Times features four in this year's season preview of architecture: Frank Gehry, Preston Scott Cohen, Zaha Hadid and Rem Koolhaas. 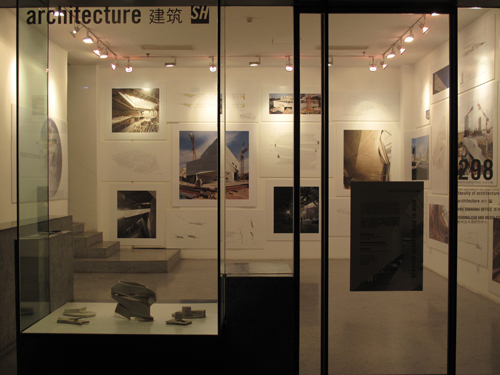 The Preston Scott Cohen in Asia exhibit opens at the HKU SH Architecture Study Centre in Shanghai. Architect Magazine awards PSC with the 2010 Progressive Architecture Award in architecture for the Taiyuan Museum of Art. PSC Inc. wins competition to collaborate with Gehry Technologies GT Studio on the Datong Library project. Panelized surface using tangent and secant plane discretization displayed in the Living exhibition at the Gwangju Design Biennale. Datong Library schematic design presented to city officials in Datong, China. Preston Scott Cohen presents to the Taiyuan Drum Tower Traditional District Planning competition jury. The proposal is now part of a continuing exhibition at the Taiyuan City Planning exhibition center. 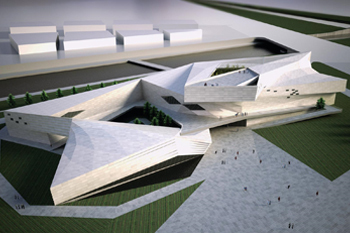 Taiyuan mayor Jiuchang Ji, planning authorities and construction authorities approved the final design and budget for the Taiyuan Museum of Art. Construction scheduled to begin April, 2009. Torus House exhibited at the Museum of Modern Art, "Dreamland: Architectural Experiments since the 1970s"
Preston Scott Cohen Inc's recent project Ordos 100 is on display in Le Chamois de Messidor in Berlin, Germany. The exhibition includes Preston Scott Cohen, Paul Ekaitz, Larissa Fassler, Hadley + Maxwell, Antonia Hirsch, Darri Lorenzen, Michael Wesely and Philip Wiegard. July 3 - August 16, 2008 opening Thursday July 3, 7pm. Recent projects of PSC Inc. are featured in "Performalism", an exhibition of digitally generated architecture at the Helene Rubenstein Pavilion, Tel Aviv. Mohsen Mostafavi, Dean of the Harvard University Graduate School of Design, announced on May 8, 2008 the appointment of Preston Scott Cohen as Chair of the Department of Architecture as of 1 July 2008. 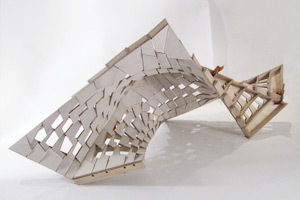 Cohen is the Gerald M. McCue Professor of Architecture, coordinator of the first year design studios, and he teaches the foundation course in projective and topological geometry, advanced studios, and design thesis.